Sgt. Melvin H. Bilderback, son of Mr. and Mrs. W. E. Bilderback, attended school in Loveland; husband of the former Dixie Newcomb. 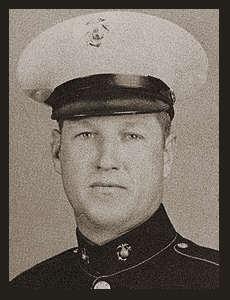 Entered the Marines in Nov. 1942, trained in San Diego, Cal; served in S. Pacific. Awarded Asiatic Pacific Ribbon with two Battle Stars, Letter of Commendation.